I think ever since our summer vacation and VBS, we haven’t really taken time to have some outdoor fun. Well, that excludes our weekly visits to church, in-laws and going out as a family and extended family. I’m talking about just the girls – me and KT! Yesterday morning, I woke up and decided that I need to take a break and enjoy the day with my little friend KT before she gets busy with school. As soon as our house help finished her work, KT and I headed out. We drove to a mall. The weather was very kind to us making the drive so much fun. The new flyover connecting Kukatpally and HiTech city is an out-of-India experience! KT was a great companion to shop with. She patiently stood by me while I browsed clothes. It’s one kind of fun going out with spouse or friends and it’s another kind when you are on your own with your little girl. After a little shopping and a lot of window shopping, I took her to the play area. Unfortunately our apartment does not have a play area and the nearest park is a 45 minute drive. Sadly even that park is poorly maintained. So you can imagine what a treat it was for KT to be at the play area! We then continued with more window shopping. When you spend a few hours with a child you realize how little things make kids so happy. As of now, KT does not demand clothes or toys. For her simply going up and down the escalator was entertaining enough! 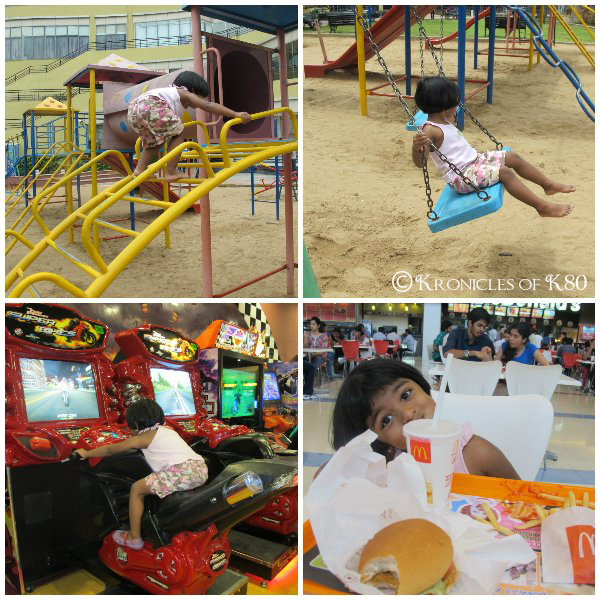 We wrapped up our day with lunch at McDonalds as KT loves it! One of the best things I did last year was learning driving. Little did I know something as simple would boost one’s confidence so much. I feel very independent now, no longer dependent on hubby to take me around. A big thanks to Vj for trusting me and motivating me to drive! It may have been just a visit to a mall, but it provided me and KT a great time to bond with each other, enjoying each other’s company! Hej! Hej! I am Michelle, mom of Kaity and Krissy. As much as I enjoy being a mother, I enjoy documenting our life on this blog – moments I cherish, conversations I treasure, life lessons I learn from my girls and the lessons I would like them to remember as they grow, our travels, adventures along the way and my journey as I follow my heart & passion in photography! Welcome to our world!